Spiral-bound receipt keeper stores your receipts in one place. No more searching through cluttered drawers or being stuck with unwanted merchandise because you can’t find the paperwork. Sort receipts into 6 categories: family, home, personal, gifts, mail order/online and other purchases. Store and track receipts year-round. Receipt holder features 12 pages with 6 categories. 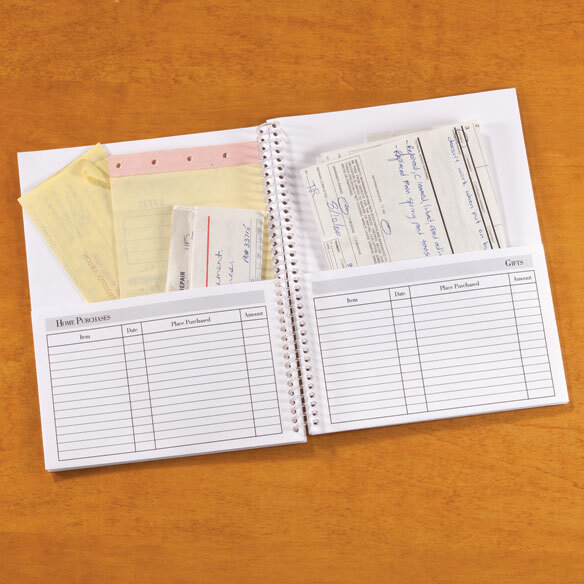 7" x 9" spiral-bound receipt organizer lies flat. I buy one for each year! I read all the reviews and bought it anyway and I am glad that I did. I had receipts laying all over my desk and it was a mess. With this I can alphabetize and store them away. I wish I had this years ago. It is not made of very sturdy paper, so it is not meant for heavy use - it is meant to keep things together for reference and help with clutter. My 2nd one easy access to my major purchase receipts! I use this for major purchase receipts for warranty purposes. Might buy but is smaller than I thought it would be. I am using the product for shopping receipts. I accumulate a month's worth of receipts in a basket and at the beginning of the next month, I sort through the receipts, put them in date order and place them in the corresponding months pocket. This is much better and faster than doing it at the end of the year. I would buy again. Great gift for teens and SHOPPERS! This is excellent for those who shop a lot and need to keep their receipt. Great for a teaching tool for teens, when responsibility and managing what you buy, how mush and how often. While this item is good for organization of receipts, there isn't much to it. It's not much more than paper with some places to hold the receipts. It could have been done as a school project, not as something that should be sold through a catalog. I'm afraid I don't feel it was worth what I paid for it due to the lack of quality. Not as represented in the catalog. Was not able to use this product. Returned it! because of categories and pockets to hold receipts. Wanted something that I could keep my receipts all in one place instead of scattered all over and not able to find a receipt when needed. 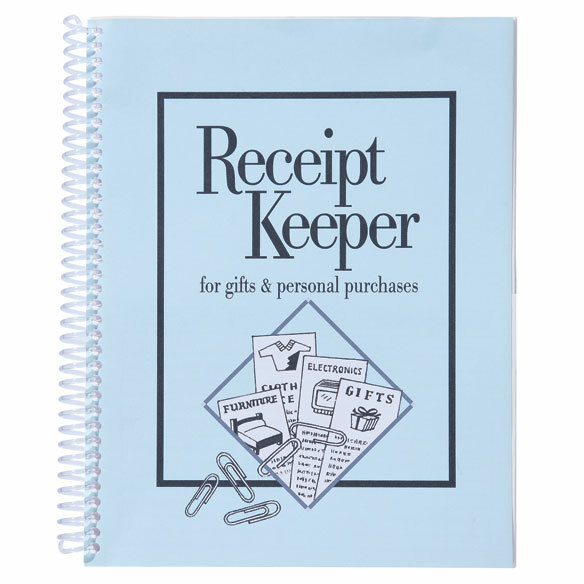 I am an older adult & have a hard time remembering where I put important receipts, therefore, I am ordering this to put all my receipts in & to know they are all in one keeper, puts my mind at ease! My daughter has her own business and this will keep her records straight. I am having a hard time keeping the bills in one place to remember to pay them, and the receipts of what I have already paid. This is an excellent place to keep all your receipts. I know, for myself, I am always searching for receipts. To be able to go straight to the receipt could save a lot of frustration, and make returns go faster. I can never keep up with all my receipts! I'm hoping this proves to be helpful. I have receipts everywhere. Have one and love it, but it's way overstuffed. So yay, for finding a new one! Hopefully to get me more organized. Want ways to stay organized. Keep all my receipts in one place. This seems to be an organized way to keep receipts. I like to be organized, and even though, I don't have many receipts, it will be nice to have them in one designated place. To hopefully organize my receipts for tax time. I need an organization method for organizing my receipts. To be better organized at tax time. Looks like I can really get organized with this.